Why have eight President declared foreign oil an enemy to the nation while dependence on foreign oil increased from 20% to 45% of needs? Exercising the self-discipline to become energy self-reliant by 2020. Debt collapsing the ability to buy foreign oil, Oil Famine. This nearly occured in Sept 2008. America’s energy self-reliance requires a 45% reduction in oil use by 2020. The failure of gradual solutions is vividly illustrated in that for 25 years American soldiers have been trading their lives and wounds to buy Americans time to gradually restore energy self-reliance without any substantive action by the Federal government or the people to honor that sacrifice. Each Memorial Day increase the tax on foreign oil $30 a barrel until the sacrifice ofsoldiers has been honored by restoring American energy self-reliance. Apply this revenue to pay-off the national debt caused by oil-wars since 1991 to protect access to that foreign oil. Debt is the tax on future labor. These war debts are a tax on the future labor of children imposed without their consent, Taxation without Representation. "The earth belongs to the living". The US military cuts it use of oil to within domestic resources by Memorial Day 2016, a 45% cut in oil use. The military has the leadership skills to lead the effort to defund terrorism and honor the sacrifice of soldiers. The Federal government cuts its use of oil to within domestic resources by 2017. State governments cut their use of oil 45% by 2018. The nation cuts its use of oil 45% by 2020. The typical American uses 88.5 megaWatt-Hours of energy per year. Cutting all energy use 45% would put the average American at 48.7 megaWatt-Hours, or roughly the same as the 47.2 megaWatt-Hours used by the average German. Americans would save $300-$500 billion a year in foreign oil costs. Defunding our enemies may also make it possible for Defense spending to be cut $300 billion. Alternative transportation networks and making cities walkable and bikeable may also cut accidents in half, saving $400 billion per year. There will be sacrifices. To mitigate these in the general economy, the military needs to lead by example. The military does not need to generate a profit and defeating terrorism by starving terrorists of oil-dollars should be a primary mission. Eight Presidents have declared foreign oil an enemy. Calls for gradual solutions to end Federal support for foreign oil dependence repeats the known path to the Civil War. As the path to the Civil War unfolded schemes were promoted for gradual emancipation, for exiling Black Americans through the Colonization Society, and Federal support for the gradual spreading of slavery through the Kansas-Nebraska Act and the Dred Scott Decision. or, a long bloody war followed by immediate emancipation of slaves and establishing citizenship through the 13th, 14th, and 15th Amendments. Achieve energy self-reliance by 2020. Enforce America’s founding law that the Federal government must “provide” for the defense of liberty for Posterity and limit infrastructure involvement to no more than “post Roads”. or, a long bloody war, as energy self-reliance is forced by the collapse of debt’s ability to buy access to foreign oil. This collapse nearly occurred in Sept 2008. We are lucky. To end Federal support for slavery required an Article 5 Amendment to the Constitution. To end Federal support for dependence on foreign oil requires only enforcing the Constitution as written and intended. Federalist #51: “If men were angels, no government would be necessary.” We form governments, sacrifice some natural rights for civil right in forming governments to monopolize the application of violence in a society and against foreign societies. We want a monopoly of extortion (taxes), of property confiscation (eminent domain), of physical violence (imprisonment and war). We subordinate that monopoly to apply violence to the Rule of Law at constitutions, written laws, and common laws. The United States of America’s Constitution is an enumerate powers document, powers not enumerated as sacrificed are retained by the people and States as the people mandate in State Constitutions. 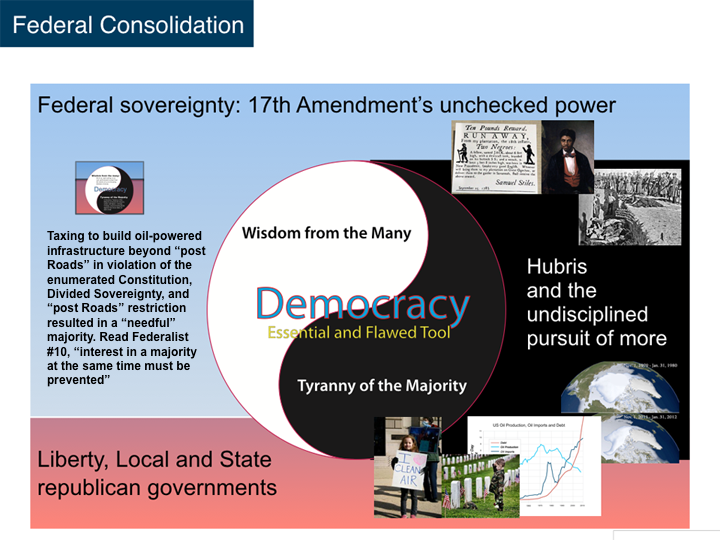 Divided Sovereignty is specified by “We the People” in the Federal mission statement, the Preamble. The mission mandates the Federal government “provide” for the defense of liberty for ourselves and our Posterity while restricting it to only “promote” welfare. Providing welfare in the form of roads is limited to defending free speech by assuring letters could be delivered if no other means exists via “post Roads.” This “post Roads” restriction was voted into the Constitution on Sept 14, 1787 to prevent a Federal transportation monopoly from repeating the defects of the King’s monopoly (East India Company, Boston Tea Party). Amendments 9 and 10 of the Bill of Rights restate the Divided Sovereignty of the Preamble and enumerated nature of the Constitution. Federalist Papers #9 and #10 explain the defense against Tyranny of the Majority in a democracy. They explain Divided Sovereignty; “Should abuses creep into one part, they are reformed by those that remain sound.” As a diverse ecology in nature is durable, so is a rich ecology in a society. "Having considered the bill this day presented to me entitled 'An act to set apart and pledge certain funds for internal improvements,' and which sets apart and pledges funds 'for constructing roads and canals, and improving the navigation of water courses' . . . I am constrained by the insuperable difficulty I feel in reconciling the bill with the Constitution of the United States to return it with that objection to the House of Representatives. The legislative powers vested in Congress are specified and enumerated in the eighth section of the first article of the Constitution, and it does not appear that the power proposed to be exercised by the bill is among the enumerated powers." In 1982 liberty to choose communications networks was restored to the people by the court breakup of the Federal monopoly under AT&T. Long-dormant innovations such as the Internet (1969) and radio telephones (1946) were commercialized. A century of centrally planned rotary telephones was displaced as millions of jobs were created deploying vast innovations, with better service at lower costs. Freight railroads average 480 ton-miles per gallon, at over 100 times greater efficiency than highways move people. Yet Federal policies caused the bankruptcy of nearly half the freight railroads since The Federal-Aid Highway Act of 1956. The Personal Rapid Transit (PRT) network built in Morgantown, WV as a solution to the 1973 Oil Embargo has delivered 110 million oil-free, injury-free passenger-miles. In the same period that PRT has been injury-free, 1.7 million Americans have died on the highway monopoly. Sunshine is spread out thin and so is electricity. Perhaps they are the same, Sunshine is a form of energy, and the winds and the tides are manifestations of energy. Do we use them? Oh, no! We burn up wood and coal, as renters burn up the front fence for fuel. We live like squatters, not as if we owned the property. Wisdom from the Many. All of us, each acting in our own self-interest is wiser than the wisest of us at choosing between choices. Tyranny of the Majority. Tyranny of the Majority in America accounts for slavery, Indian annihilation, Climate Change, and the borrowing of $53,000 against the future labor of every child in America without consent. Solving Climate Change in a democracy requires Wisdom from the Many choosing energy self-reliance over a Tyranny of the Majority that provides current voters with economic benefits from burning coal and oil while socializing the costs against the liberty and survival of Posterity; children, like slaves, are a non-voting minority. Illicit Energy is dependence on energy outside self-reliance, obtained at the expense of others. In America, Tyranny of the Majority resulted in Federal support for the Illicit Energy of slave labor causing the Civil War. This path to war has been recreated by Federal support for Illicit Energy from foreign oil. "So there are particular moments in public affairs when the people, stimulated by some irregular passion, or some illicit advantage, or misled by the artful misrepresentations of interested men, may call for measures which they themselves will afterwards be the most ready to lament and condemn." The 16th (Income Tax), 17th (popular election of Senators) and 18th (Prohibition) Amendments were passed at a time when Americans wanted more democracy, less liberty, and more Federal powers to correct defects they saw in society. Federal consolidation policies followed quickly. In the mobilization to fight World War I, President Wilson monopolized communications and socialized power and transportation infrastructures as “natural monopolies.” As the steady pace of Federal taxing and building communications, power and transportation networks grew, dependence on these Federal internal improvements also grew. The centrally planned infrastructure defined the rules of economic competition. The unintended consequence is a new Tyranny of the Majority; drivers wanting cheaper gasoline. To support this majority, the Federal Governing depleted resources, polluted, waged oil-wars, and borrowed $18 trillion against the liberty and future labor of children, a non-voting minority. Correlation between Federal support for slave labor and mortgaging the labor of children is elaborated in other papers. In both cases the value of labor is confiscated without consent. The physical terrors of slavery are currently absent in our treatment of children, but that may change when oil supply shocks transition into Oil Famine. Veterans. Veterans have been trading blood for 25 years to buy Americans time to end our foreign oil dependence. They will rally to end dependence on foreign oil. Anti-war activists. Ending dependence on foreign oil end a reason for Federal foreign-war adventures. Advocates for a stronger national defense. Defunding terrorists deprives our enemies of the ability to wage war. Environmentalists. They are already calling for a tax on carbon that cannot pass the current Tyranny of the Majority. A tax on foreign oil can be passed. Domestic energy producers. Eliminating foreign oil will make their products more valuable. This will be a boom to domestic oil, solar manufacturing, and energy conservation interests. Tea Party advocates. Seek smaller Federal government with less debt. The $18 trillion in Federal debt is highly correlated with foreign oil imports and the expansion of the Federal government to support oil-powered infrastructure. Occupiers. Federal policies which socialize resource depletion and pollution transfer wealth from the many to the few. Posterity is deprived of equal access to resources as they are depleted; those who hold resources see their value amplified. The young and economically weak who must exchange their labor to buy assets, see the value of their labor debased. People act on emotion and justify with reason. Factions represent people’s emotional commitment to a political opinion. Environmentalists and domestic oil companies, Tea Partiers and Occupiers, Veterans and Anti-war Activists, are not generally allies. “No foreign oil by 2020” limits the scope of work to something these factions can align with to create a new majority. "By 2012, surplus oil production capacity could entirely disappear, and as early as 2015, the shortfall in output could reach nearly 10 million barrels per day." "A severe energy crunch is inevitable without a massive expansion of production and refining capacity. While it is difficult to predict precisely what economic, political, and strategic effects such a shortfall might produce, it surely would reduce the prospects for growth in both the developing and developed worlds. Such an economic slowdown would exacerbate other unresolved tensions, push fragile and failing states further down the path toward collapse, and perhaps have serious economic impact on both China and India. At best, it would lead to periods of harsh economic adjustment. To what extent conservation measures, investments in alternative energy production, and efforts to expand petroleum production from tar sands and shale would mitigate such a period of adjustment is difficult to predict. One should not forget that the Great Depression spawned a number of totalitarian regimes that sought economic prosperity for their nations by ruthless conquest." "Energy production and distribution infrastructure must see significant new investment if energy demand is to be satisfied at a cost compatible with economic growth and prosperity." "The discovery rate for new petroleum and gas fields over the past two decades (with the possible exception of Brazil) provides little reason for optimism that future efforts will find major new fields." Life requires energy. Oil is finite. Americans must fight for foreign oil or be energy self-reliant. The following graphics illustrate the risks to Posterity. The left graph illustrates consequences of Federal highway policies. As the Federal government built oil-powered infrastructure, nearly half the railroads in America went bankrupt, cities sprawled, family farms were collectivized, and American were forced to buy cars and oil to be economically competitive. As US oil fields depleted (Light Blue Line), Federal policies subsidized the importing of foreign oil (Dark Blue Line) and oil-wars, by borrowing $18 trillion against the future labor of children (Red Line). The images on the right show the multi-year loss of Arctic sea-ice as Federal policies socialized pollution risks. Life requires energy. Oil is finite. Life and nations powered by oil are terminal. The Federal mandate of a 45% dependence on debt to buy foreign oil is the path to war. “Secure the Blessings of Liberty to ourselves and our Posterity” is the objective of the Federal government. Federal highway policies fail this mission by mandating Illicit Energy, subordinating the survival of America to the power of foreign oil, tilting the balance of nature with pollution, oil-wars since 1991, debt of $18 trillion, and funding terrorists with oil-dollars. Federal highway policies violate the written Constitution’s enumerated nature, restriction in the Preamble, the “post Road” restriction, and Amendments 9 and 10 of the Bill of Rights. The US military needs to lead the nation by defending the Constitution against our lack of self-discipline to be energy self-reliant. Terrorist threats to America can be defunded by powering America’s defenses within domestic resources; immediately cut oil use 45% by Memorial Day 2016. The nation must honor those who bought us time to become energy self-reliant by doing so by 2020. Impose $30 a barrel tax on foreign oil and increase it by $30 a barrel every Memorial Day. Federal support for slavery ended in 4 years with a long and bloody domestic war. By 2020, terrorists can be defunded and America can exit the current path to war by cutting oil use by 45% to become energy self-reliant. Reference: Lifeboat Paradox. "If you are self-disciplined to have, and be skilled in the use of a lifeboat, you are not likely to need one."